Last week, the Federal Energy Regulatory Commission (FERC) denied the Jordan Cove Project. We were shocked as FERC is known as the rubber-stamping government agency that approves fossil fuel projects at any cost. Even the promoter of Jordan Cove, Canadian-based Veresen Inc., said it was “shocked and disappointed” with the decision. 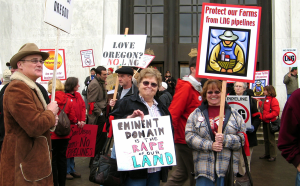 The energy scheme would have resulted in the construction of the 232-mile Pacific Connector Pipeline through southwest Oregon, which would have brought fracked gas from Canada and the Rockies to Coos Bay where it would be super cooled and exported to markets in Asia — a real loser for clean water, wildlands, climate stability and families in the path of the pipeline. 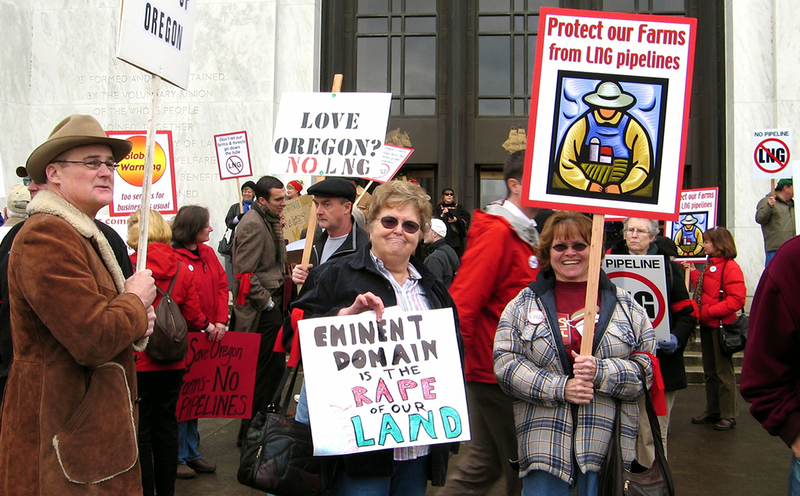 FERC had already missed its decision deadline scheduled for December 29, so by March 2016 we were wondering, “Were they late because a group of the landowners under threat of eminent domain recently wrote to FERC?” On lawyer letterhead, they reminded FERC that if there were no buyers for the gas Veresen wanted to export, there was no “public need” required for eminent domain to take their farm and forestlands. Veresen had recently admitted to FERC it had no buyers for the gas, and only 3% of the impacted landowners had agreed to host its pipeline. FERC could not give Veresen permission to forcibly condemn 97% of the private property needed for the pipeline if no one wanted the gas. (That is actually FERC’s definition of public need… that there is a buyer for the product. The landowners also objected to a foreign-owned corporation taking their land only for corporate profit). The cheers of victory reverberated around the 650 impacted landowners and dozens of organizations who have fought this terrible project for over 10 years. The day was spent on the phone, email, and social media in tears of joy. This gas export scheme would have been Oregon’s largest source of greenhouse gas pollution, with an infrastructure tying us to fossil fuels for decades, and it would have impacted 33 rare fish and wildlife species protected under the Endangered Species Act. Moreover, the liquefied natural gas terminal would have been built in a tsunami evacuation zone where the big one is expected at any time. Let’s all rejoice in FERCs decision to deny it, even if the decision was not for any of the reasons mentioned above. While we should celebrate this victory, our work is still not done. We need to convince Oregon Governor Kate Brown that if FERC found no need for this project, the state should also stop work on the many permits required for the Jordan Cove export terminal. A word of caution: FERC’s decision stated that if Veresen finds any buyers, FERC could reconsider their decision. And sure enough, on March 22, Veresen announced, with great fanfare, that it may have found a buyer and is in “preliminary discussions” for 20% of the production capacity at Jordan Cove. Its press release included small print saying “no assurances can be given as to future results… undue reliance should not be placed.” We hope FERC pays attention to the small print, as we can imagine its rubber stamp quivering in the air.